I have the same basic snowblower. Ariens Pro 1332. 13 hp with 32" auger. Mine has a 12volt battery for starting instead of 120volt. (motorcycle battery size). There are Pros/Cons to the battery. It's great when power is out or when you have to restart it away from the garage, but you do have to deal with a battery tender during the summer, etc. 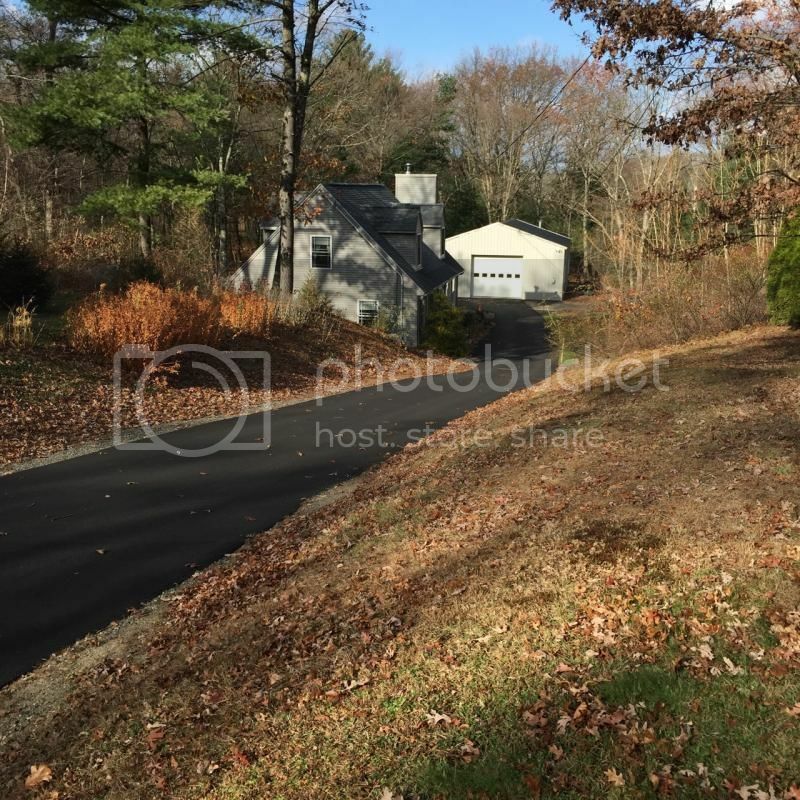 I have a 650' paved driveway with a pretty good incline. I'm happy with the snowblower. Takes me 30 - 90 minutes, depending on how much snow and if I get picky and do all my walkways, or just do a quick driveway clear to get to work. I got lucky and got a great deal on Craigslist during the summer. The guy I got it from bought a new bobcat to clear his 100' driveway. He was retired with way too much money to burn. My experience as well. Honda has no competition when it comes to snowblowers. I wouldn't really say that about the starting. My Ariens always started 1st pull with the cord, as well as the Cub Cadet I have now. I also rarely used the electric starter on them. My crappy old MTD usually starts the first time of the second pull. But, Honda is where it's at for performance from what I've seen. Yamaha is supposed to be better than Honda, but they don't ship to the states anymore. Some grey market units come down from Leafland though. I found a 36" ariens professional for under 2 grand (its used) probably going to go with that and see how it goes. Perfect machine for what you are doing! That is strongly contended. And the orange owners are just as attached. But what I've found is that very few people compare them head-to-head. It is usually a 30 year old Ariens compared to a new Honda, or a 15yo Honda compared to an Ariens Pro, but it's usually new versus old and apples versus oranges. And I got to thinking that people buy multiple motorcycles or snowmobiles or even cars just for fun, but when it comes to a tool like this, they usually buy the cheapest thing they can get away with, which is seldom fun. So tomorrow or this weekend I'm picking up a Honda HS928TA Model Info |28" Two-stage Snow Blower | Honda Snow Blowers for our NH place. We already have an Ariens Pro 928 up there. Both machines claim 14 ft lbs of torque, and they have the same bucket size. The Ariens has their friction disk drive and wheel drive, while the Honda has hydrostatic track drive, so there is that difference. But at some point I should be able to compare them head-to-head in a full-width, full-depth snowfall where drive difference may be less important. 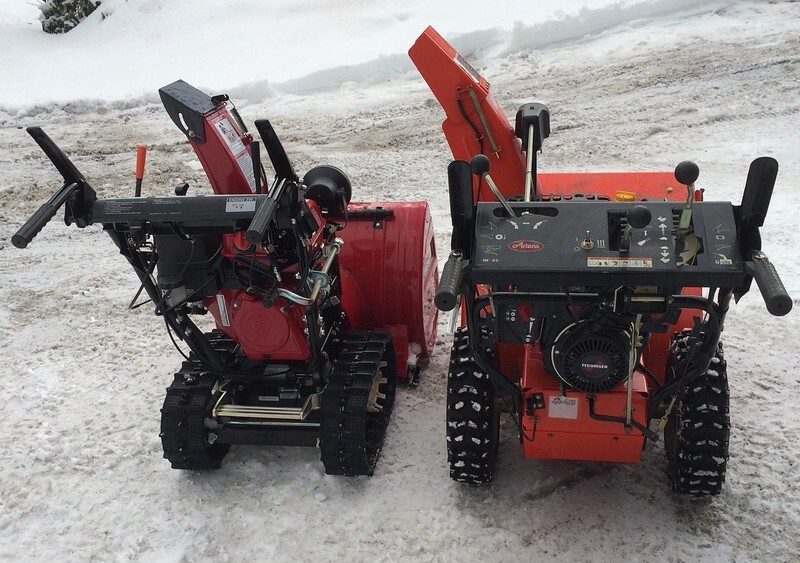 In general the Ariens machines have substantially more powerful engines at any given size. They also have track and Hydro models that compete head-to-head with Honda. So for example while the HS928TAS has 14 ft lbs of torque, the Ariens Hydro Pro Track 28 has 21 ft lbs and costs about the same. If I'm really motivated, I'll take it down to Boston as well. Boston gets a lot more snow than the statistics show because the snowfall is recorded out in the harbor at Logan airport. So while Boston officially averages about 45" of snow per season, at the Blue Hills Observatory (which you can see from my house) they average 60". But it is usually wind-driven, heavy, and often laced with road salt, so in many ways it's a tougher challenge than powder. I'm on my third snow thrower in Boston - an Ariens 1124 Pro - and it's the first one that wouldn't choke on the salty, slushy mix we get here. This won't cost me much of anything because I bought the Ariens very right last summer, and after the 2nd or 3rd storm of the season most of the dealers sell out. And buying a Honda is like investing in gold, amiright? So stay tuned. Maybe we should have an NESR snow thrower Olympics? There have been rumors of a BMW airhead powered machine for some time, and there are a couple of machines on youtube with B&S Vanguard twins! Last edited by Garandman; 12-11-14 at 09:09 PM. That's a good one but I prefer OPEonthenet. OP, there are several 1336 Pros on the market now at reasonable prices. But get the model # and serial # and check how old it is: I've seen machines being sold that are 10+ years older than stated. A good way to tell if it has been well maintained is to pull the shear pins and see if the rakes will rotate on the shaft Ariens have zerk fittings and they are supposed to be lubed yearly and the rakes rotated to distribute the grease. If you do not do this, your auger gearbox becomes a very expensive shear pin. Also if they are not stored properly the rpms will hunt up and down. Late model emissions carbs have plastic parts inside and can be almost impossible to rebuild. Not a show stopper as you can buy a new one for $50-75. Some users order the carb for pre-emissions models (2005?) as they had adjustable brass needle seats. Everyone else, buy shear pins and put them where you can find them during a snowstorm! I realized last week I had spare shear pins - in my desk at work! 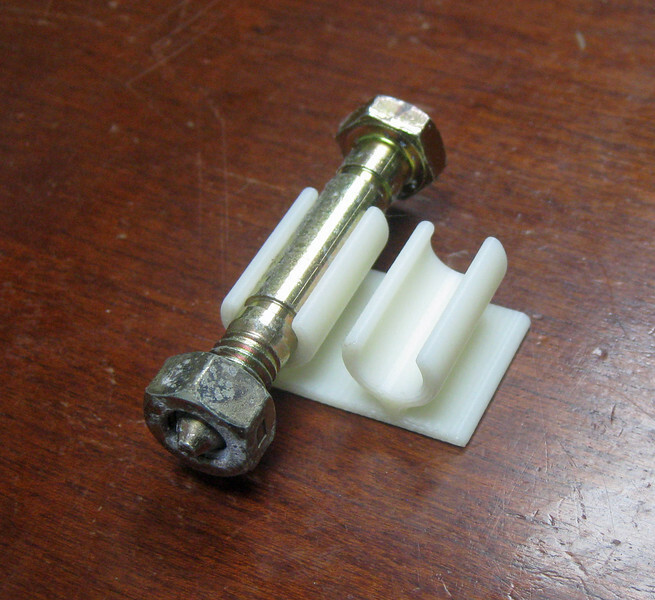 Finally, if you have an Ariens and want a shear pin holder, pm me your name and address. I made some on our 3D printer. Last edited by Garandman; 12-12-14 at 05:58 PM. TaDa. Bought it at Naults Windham, pickup tomorrow. Paid $2,599, a small discount. I believe they have 0% financing available, didn't inquire. I think my entire "race program" may have cost less than that. Since you can't read, what I said basically was that all brands seem to start just fine on the first pull. From there, they differ. So settle down with your "snow throw championships"! Next big storm, anyone with a Honda can bring it over and prove it is better by doing my driveway. I'll stand inside by the fire and time you to see if the overall time is better. The difference being the cost is defrayed by the $50-100 per storm for a plow guy. And I have to clear around the house, garage, wood pile, turn around, etc. We've already received 23" of snow this season: plow guy has come 2-3 times and I've done more clearing as well. We've gotten 3" in Boston, Burlington VT 30", Caribou ME 42" etc. Last edited by Garandman; 12-13-14 at 04:35 AM. Last edited by DucDave; 12-13-14 at 03:21 PM. Let me start off by saying I own quite a bit of Honda "stuff." Between work and home that includes one motorcycle, two generators, three cars, a lawnmower and now a snow thrower. So I appreciate a great deal about Honda engineering. But they have plenty of competition. Today I picked up the HS928TA and headed up to our place near Mt Sunapee. The plow guy had done the driveway so I just had some cleanup around the house and garage. It was about 6" of snow, with the first 4" very crusty and the top two inches more powdery. The summary is no way I am giving Honda an edge. It's a good snow thrower but so far I am underwhelmed. There is many reasons why Ariens has a lot of market share. So to demonstrate the design decisions made by the two engineering teams, here are the Ariens Pro 926 and the Honda 928 side-by-side. The Ariens has a taller, deeper bucket with a rolled leading edge. 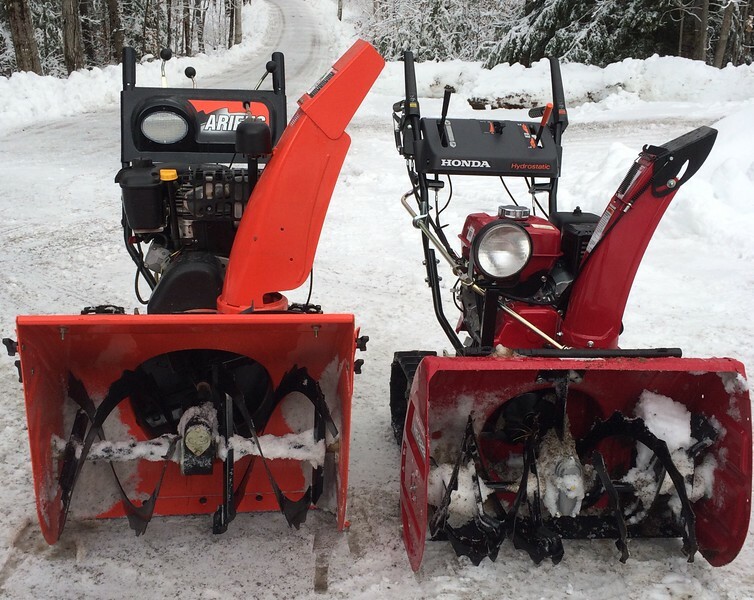 The Ariens has 16" rakes compared to 14" rakes on the Honda. The Ariens has a 14" diameter impeller compared to an 11 or 12" on the Honda - it wsas getting dark so hard to measure. Ariens has a cast iron auger gear case: Honda appears to be aluminum. The output chute is 5" on the Honda versus 6" on the Ariens. The Honda handlebars are a little lower: how much lower depends on how much you tilt the bucket up or down. The most obvious difference is the track drive on the Honda and I was very disappointed. I expected the track drive to give better traction in the hard snow, and allow me to keep the nose down better. But the tracks often slipped (so did the wheels) and because the Honda isn't too heavy, it still floated up on this snow. Angling it down even more and making a second pass worked better, but the wheeled machine did Ok on the second pass as well. (I should add that the Ariens has an optional 10lb weight in the bucket). The Ariens has tall, fairly narrow wheels with the latest snow tread and I found the difference in traction to remain a question - not something I'm prepared to decide on after 15 minutes of use in one set of conditions. The Honda motor starts easily and is noticeably quieter than the Tecumseh OHV in the Ariens. Fuel consumption TBD. I use Mogas (93 Octane, no Ethanol) to minimize carb problems. When blowing a full swath of snow, the Honda makes a cool sound and the stream is very concentrated. The Ariens engine noise drowns out the impeller noise and because of the larger chute exit and chute, the output is less concentrated and may not throw as far. But the Ariens appears able to throw a lot more snow because of the volume. Again, TBD. My son is 11 and at that age kids are excited to operate anything you will let them get their hands on. So at worst, I've halved my work. Last edited by Garandman; 12-13-14 at 05:51 PM. Garandman, I have a 928 tracks. Where it really impresses is at the end of the driveway where the town plows create a huge berm. With the hydrostatic I can go forward-backwards-forward and chip away at it much faster than any non-hydrostatic machine. 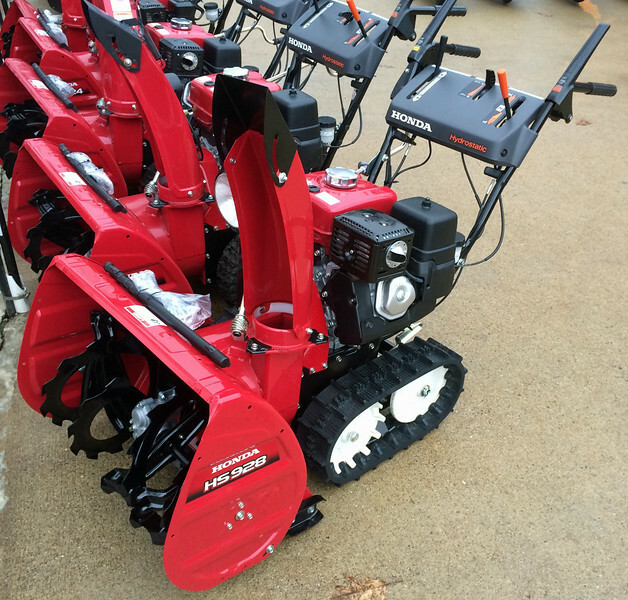 [*]Ariens has a cast iron auger gear case: Honda appears to be aluminum. maybe I can't see it in the photo, the Ariens appears to have a floating gearbox ? The jury is still out for me on the hydrostatic feature: for what you pay you can buy a much heavier, more powerful friction disk machine. Check back with me in March to see if I've changed my mind!